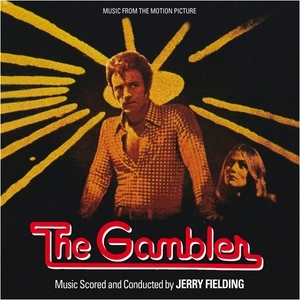 Jerry Fielding's music for The Gambler is the 302nd Soundtrack of the Week. This is a very atmospheric, textural record. Lots of sustained tones and precise harmonic movement. Much of it makes me think of the beginning of Alexander Courage's Star Trek theme. It's ethereal, moody chamber music basically. Strings holding notes while horns and other instruments craft exquisite miniature melodies on top. There's some beautifully subtle use of harp and timpani. It's funny, though, after about 42 minutes of this there's an explosion of sunny, groovy source music, all unapologetic 1970s pop flavors! Some really funky, soulful stuff here as well, particularly in the source music for the Harlem bar scenes. There's also a brief burst of klezmer. I haven't seen the movie so I'm not sure what that's about. After that come some alternate takes of cues from the score. Excellent CD!